Posted October 10, 2012 by Jason & filed under Problem Solving. Imagine a problem so mysterious, so fluid and so fiendishly complicated that it was impossible to comprehend, let alone solve. For a start, this nightmare problem would be essentially undefinable; you’d never actually know what the real problem was until long after the solution had been attempted… by which time you’d realise you’ve solved the wrong problem. The problem would be unprecedented, unlike anything human beings had ever faced. Nothing that had ever been learned from any other problem in history could be adapted or applied in any way. Forty years ago two design theorists (Horst Rittel and Melvin Webber) described this theoretical nightmare and gave it a scary name: The Wicked Problem. The idea was an instant hit at the Pentagon, as it gave an convenient explanation for the mess in Vietnam. ‘Hey, we didn’t screw up’ they said, ‘war is wicked… unknowable, unpredictable and unending. You just gotta go with your gut and hope for the best’. In recent years we’ve seen poverty, crime, homelessness, drug addiction, the road toll and unemployment declared as ‘wicked’ on their way to the Way Too Hard basket. What’s next? Childhood obesity? Traffic jams? Junk mail? Tooth decay? 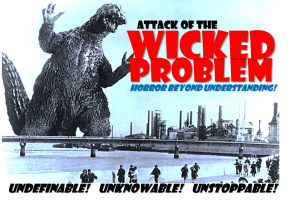 I’m sure some problems are truly wicked; our climate problems seem to fit the criteria very closely, and for all I know macroeconomics might run a close second. But the vast majority of the challenges facing us right now are not undefinable, unique or mysterious shapeshifting monsters; they’re relatively straightforward problems that have gotten big and ugly simply because we’ve ignored them for such a long time. Whenever we imagine a problem to be a monster, we leave it for our grandkids to fix.